In video games, elected officials usually take on the role of the bad guy or the cowering schmuck in a tie who needs you to save the day. They're a blank canvas with power, so it's usually pretty easy to paint them into one of those two corners. Sometimes, though, video game presidents, mayors and the like are willing to roll up their sleeves and get in on the action themselves. Here are five of our favorite politicians from video game history. In honor of President's Day, we decided to comb through video game history to find some elected officials who weren't afraid to get their own hands dirty. When you think of video game presidents, it's likely a super sinister evil-doer that jumps to mind, one of the countless cliche villains of action games aplenty. Or, for those of you who love big “surprise” twists, it's the elected official who was giving you order or encouraging you along the way until, *gasp* it turns out they were behind the evil plot the whole time. Those of you who grew up in the 90's may remember Bill Clinton as being one of the coolest presidents to ever take the oval office. Back in those days, he was calm, collected, seemed to make Democrats and Republicans alike want to give him a high five, and the dude played the saxophone. How cool is that? Perhaps Mr. Clinton's greatest though, though, was his mad hoops skills in the two-on-two basketball series NBA Jam. Originally a hidden character and boasting stats that let him slam dunk with the best of them, it's hard to argue against a president who could go toe to toe with Shaq and win. It's not easy being an elected official, especially if you've been elected to the second most powerful seat imaginable, the VP of the entire planet. 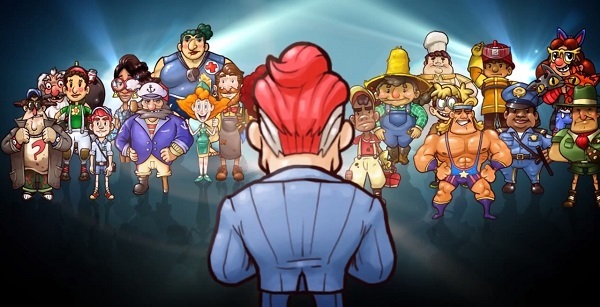 A very recent indie game that launched on just about every console known to man, Citizens of Earth puts the player in the shoes of just such a man, tasked with taking on tasks great and small with nothing but coffee and the support of his dedicated constituents at his back. Whether you're battling a group of evil girl scouts, waging war in cyberspace or saving the planet from an invasion, there's no obstacle too tall for a barista, a police officer and a conspiracy theorist who fully support the dude they elected into office. Given how badass Mike Haggar was in the Final Fight games, it's hard to imagine why more games haven't featured more presidents, mayors and the like who aren't afraid to hit the streets, and then hit the faces of thugs hanging out on the streets, like Mike Haggar. A former wrestler with the huge muscles to prove it, Haggar was elected to the post of Mayor of Metro City in his later years. When his daughter gets kidnapped by a bunch of hoodlums, though, he's no longer willing to sit behind his desk and let the criminals of the city run wild. Among Haggar's greatest achievements, though, is one of the most powerful piledrivers known to man. Abraham Lincoln: Code Name S.T.E.A.M. Code Name S.T.E.A.M. hasn't even launched yet and already we know that Honest Abe is going to be worthy of a spot on this list. In an alternate, steam-powered future, England is under attack from an alien threat. Luckily, the team from S.T.E.A.M. is here to lend a hand, a collection of literary icons led by the axe-wielding POTUS himself, Abraham Lincoln. From his top hat to his steampunk suit and the majestic zeppelin he gracefully pilots through the air, Lincoln is exactly the type of guy you want on your side when planet Earth is facing its darkest hour. In Saints Row IV, you once again take on the role of the leader of the greatest gang the world has ever known. This time around, though, your amazing leadership skills have landed you a spot in the Oval Office where, let's face it, your job description hasn't actually changed all that much. When a bunch of aliens decide to crash the party and start taking humans hostage, though, it becomes your presidential duty to send them packing by any means necessary. Thankfully, “any means necessary” includes jets, super powers and a gun that fires dubstep music and forces everyone in a given area to dance their hearts out.